San Francisco El Alto is a very busy town in the Western Highlands, whose population swells for its huge Friday market that is the largest in the country. The entire town turns into the market and there are stalls with vendors selling all kinds of textiles, fabric, food and animals. In order to avoid messy traffic jams, a special system of one-way roads is set up. It is almost impossible to find a parking spot, even in a parking lot! 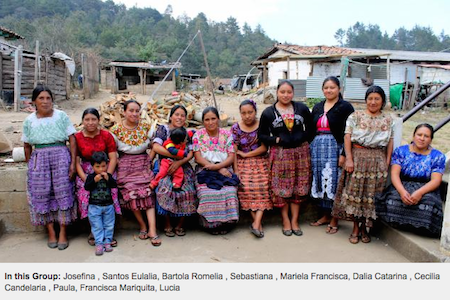 The Friendship Bridge Trust Bank “Fátima” was formed by 10 women in a rural area outside the town. The ladies’ average age is 37 years old and 70% of them went to elementary school. Approximately 30% of the women had no formal education. Lucia is the President of the Trust Bank, and her biggest desire is that her clothing business grows so that she can create a more stable economy in her home. She wants to be certain that her children receive a good education. She sells blouses, t-shirts and sweatshirts, as well as baby clothing, both in a local stand in San Francisco El Alto and in another nearby community. She is requesting a loan in order to purchase more clothing for her inventory. With the proceeds from her business, she has established another business raising pigs, and she also needs to buy feed in order to fatten them up to sell. This hard-working 30-year-old, with only a 6th grade education, is very aware that she has a lot of responsibility since she is a single mother who is separated from her husband. Lucia and her friends in the Trust Bank are most appreciative to Kiva investors for learning about them and funding their much-needed loans. They are taking positive steps towards empowering themselves and eliminating poverty in their lives. Thank you, Kiva investors! Congratulations to Fatima Group from Guatemala!